A "friend" wants to visit the UK for 6 months and stay along the south coast of Cornwall and Devon because of the photographic opportunities in this region. She contemplates renting a flat for the whole time in the interior (e.g., Exeter) and take day trips to the coast. Possibly impacting her plans is recent legislation placing a statutory responsibility upon private landlords. Surely they wouldn't restrict a tourist from renting a flat for their holiday? Or would they? How do these new rules affect visitors to the UK who want to rent a private flat? it excludes "those not renting the property as their main home", so as long as she can document an existing main home elsewhere, she should be fine whatever the case (and even more so for a short let). for others, they are entitled to rent for the duration of their leave to remain. Note that as long as they currently have leave to remain, the landlord is "excused" for a whole year, so a 6 month let would not be an issue as long as she has a valid visa at the start. 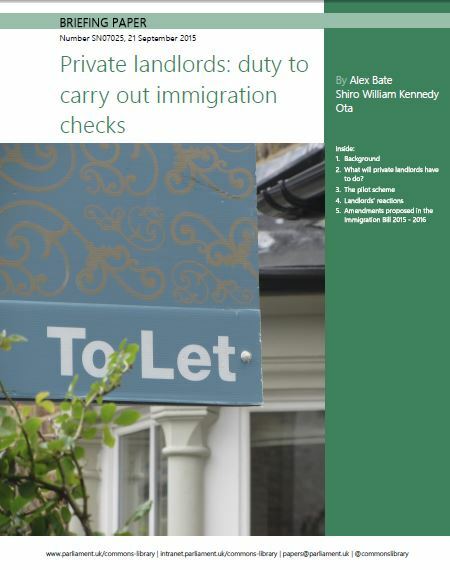 Of course, many landlords may just choose to err on the side of caution and not try to understand any of it, and just rent to British nationals (and possibly EU/EEA nationals). Probably depends a lot on the cost of the rent, the type of let (short term vs long term), the usual "target" of the landlord, whether this goes through an agency, etc. As I UK landlord, I would not to choose to rent a flat to someone that was only planning to stay in the UK for 6 months. There are a few issues. A property is normally empty for a few weeks after a tenant has left. This costs me lots in lost rent. I also need to take up reference from past landlord etc, once again taking a long time. Add to this, I expect a tenant to have a good UK credit history with a good UK job. So firstly I would need a “home owning guarantor” for her, that owns a UK home, has a good UK job and agrees to pay me any money she owes me. Then I would need her to offer 25% more rent that was I am advertised the property for. Short term holiday lets are outside of the “Right to Rent” regulations and their owners are setup for letting out short term, hence they charge over double what a landlord does. Not the answer you're looking for? Browse other questions tagged visas uk accommodation rental or ask your own question. Does the Trump travel ban affect pending visa applications? How does the UK electronics travel ban affect my travel without check-in luggage? How does a Working-Holiday visa in Germany affect existing tourist 90/180 Schengen days?